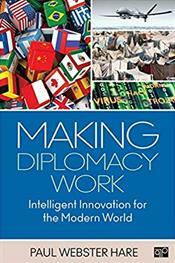 Making Diplomacy Work: Intelligent Innovation for the Modern World takes a fresh look at the practice of diplomacy, setting it in its contemporary context and analyzing the major factors that have changed the nature of the way it is conducted. The book is built on the premise that diplomacy must adapt some of its ritualistic and stale procedures to become more effective in the modern world. It provides a thorough examination of current issues from a diplomatic perspective and offers an extensive array of real-world examples. Author Paul Webster Hare brings 30 years of diplomacy experience to this title; it is a must-have volume for any student of diplomacy.